Sara Krulwich/The New York Times. 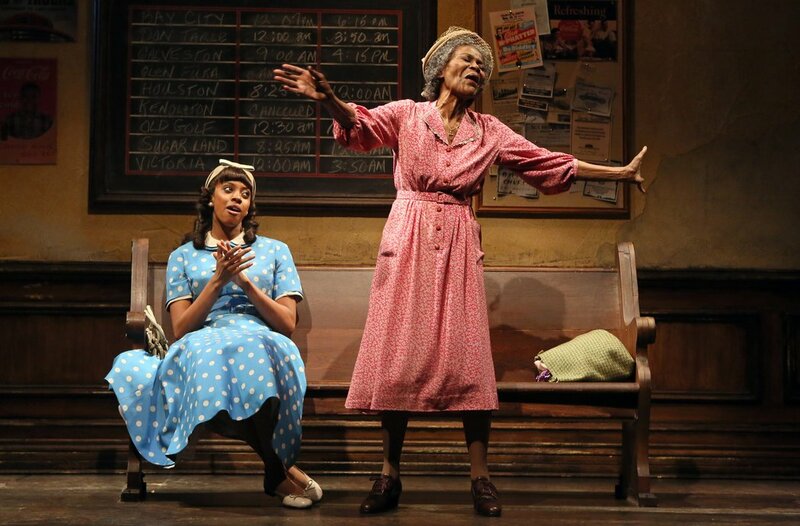 Cicely Tyson’s rousing “Blessed Assurance” in the Broadway revival of “The Trip to Bountiful” has Condola Rashad, left, and others joining in. Even Cicely Tyson was surprised. As a seasoned and award-winning actress of the screen and stage, you would imagine that few things in show business would catch her off-guard. “I didn’t realize they were doing it until someone remarked to me how incredible it was that the audience was joining in,” Ms. Tyson told The New York Times. In June, she won a Best Actress Tony award for her portrayal of Mrs. Carrie Watts in the Broadway revival of Horton Foote’s “The Trip to Bountiful.” When referring to the audience joining in, Ms. Tyson was talking about the audience singing the classic hymn “Blessed Assurance” as she sang it during an emotional section of the second act. Once Ms. Tyson discovered that the audience was singing along, she found it thrilling. “Thrilling but unexpected,” the Times points out. “Under normal circumstances the Broadway experience does not include audience participation, even when catchy songs from classic musicals are being performed. The ‘Blessed Assurance’ phenomenon is peculiar, perhaps even unheard-of, but the hymn itself is something out of the ordinary,” the Times admits. The hymn was written 140 years ago by Fanny Crosby and Phoebe Knapp, both members of John Street Methodist Episcopal Church in Manhattan – merely five miles down road from where Ms. Tyson performed her role on Broadway. There is a palpable magnetism, soothing ointment, and processional authority to hymns and gospel music. “There is no music like that music, no drama like the drama of the saints rejoicing, the sinners moaning, the tambourines racing, and all those voices coming together and crying holy unto the Lord,” wrote novelist James Baldwin in The Fire Next Time, a book about race and religion he wrote in 1963. As Baldwin poignantly observed, “There is no music like that music.” Ms Tyson was reminded by her audience of that revelation while on a Broadway stage. I was most memorably reminded of that truth in the House of Blues in New Orleans. A few years ago, my best friend and I were invited to a CD release party for the Neville Brothers while we were in the Big Easy. The Neville family has been a New Orleans music institution for more than fifty years, and the brothers (Art, Aaron, Charles, and Cyril) were in their hometown promoting Walkin’ in the Shadow of Life — a hip-hopish album of French Quarter funk, jazz, soul, and rhythm and blues. Out of all the brothers, there is one who stands out. There are two striking features you notice when Aaron Neville performs: his massive biceps and his ethereal falsetto voice. Once you come to grips with the incongruity of his hulking, muscular frame and his transcendent vocal gift, you take notice of the rosary bracelets, the distinctive mole above his right eye, the numerous tattoos—including the dagger on his left cheek. Aaron Neville sings with a sincere earnestness borne of his heartache and his eventual victory over heroin. He is the least flamboyant on the stage with his brothers, yet he is the most intense when he lays down his vocal offering—treating each note and harmony with the precision of a heart surgeon. The crowd was mesmerized as Aaron sang his classic ballad “Tell it Like it Is.” Forty-six years ago, that song shot to the top of the charts. The heartbreak behind the hit is that although it was selling 40,000 copies a week and was being played nationwide on the radio, Neville’s recording label was in a tailspin. He never saw the song’s royalties. Someone was getting rich off his artistry, but it sure was not him. While the song was topping the charts, he was busting his back as a longshoreman at the docks of New Orleans in order to feed his family. Neville was raised in a God-fearing home. His dad was Methodist and his mom was Catholic. He attended Saint Monica, a school in New Orleans run by nuns who used to get death threats from the Ku Klux Klan for teaching black kids. “They were caring women who taught me about love,” he remembers. The revelry of the Neville Brothers gig at the House of Blues came to an astounding and respectful silence when Brother Aaron began singing an a cappella version of “Amazing Grace.” There was no mumbling and the chatter ceased. There was a holy hush. I looked around and people to my left and to my right were wiping tears from their eyes. John Newton’s hymn is universally beloved — even in the midst of spilled beer and cigarette smoke. Even if we are not all ready to walk through the front door of the house of redemption, we still take comfort in knowing the porch light is on. There is no music like that music. Steve Beard is the creator of Thunderstruck.org. This column was written in 2013.